Personalised Memorial cards, bookmarks and keyrings. 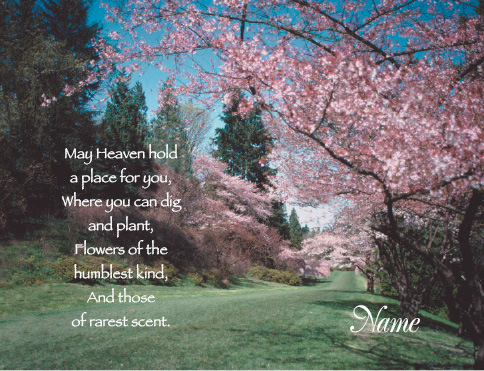 Create a personalised memorial card, bookmark or keepsake by uploading a photo and adding your own text. Then you can choose your required quantity and use our secure payment facilities. We will print your chosen design and send it to you by post. Our custom print shop offers the ease and convenience of online business, backed up by generations of experience in print. JJ Lalor is one of Ireland’s oldest printing companies, established in Dublin in 1883. Our experience is matched only by our dedication to our customers and that’s why we’re still going strong. We’ve combined our history with the latest technology to offer our customers this unique online shop. Thank you for choosing JJ Lalor. Instantly create the keepsakes you like! 4 PROOF onscreen and ORDER now! You wil recieve your keepsakes promptly by post. All orders are dispatched to you within 2 working days. Our memoriam cards are now available to order in any of the - Veritas shops countrywide Sligo, Derry, Letterkenny, Ennis, Monaghan, Newry and Cork. DEAR CUSTOMER If you don't see any thing you like or would like to change any thing please mail your order to us at jjlalor1@gmail.com or call to our shops in Dublin : Veritas House(7/8 Abbey Street Lower) and Baldoyle Industrial Estate(Unit 5,117 Grange Drive). If you have difficulties with on line order, please contact us directly by phone,facebook messenger or email us details of your order. If you order online we guarantee a FREE POSTAGE FOR IRELAND & UK! © 2019 J.J.LALOR (Est. 1883). All rights reserved. 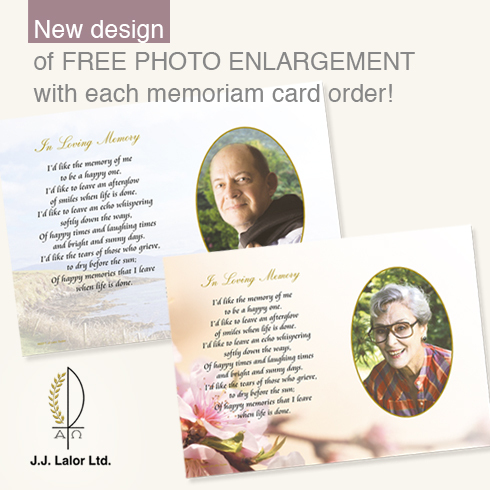 For that extra special, completely unique and personal celebration of your loved one`s life, please click here for a selection of our "Memories Range". Our Memories range cannot be ordered online so please contact our dedicated friendly staff to guide you through the ordering process.